Our good friend from Fort Smith, Ar, Dr. David Phillips, along with his friend Danny, joined us on the Little Red River last weekend for a little fly fishing. The fishing continues to be excellent with really impressive numbers of Rainbows. The hot flies were #14 Born’s Hairy Legged Sowbug, #16 Gray Flashback Sowbugs and #18 BWO Emergers. David has been an avid golfer for many years but over past several years has traded his golf clubs for fly rods and has become a fly fishing nut just like Bo. 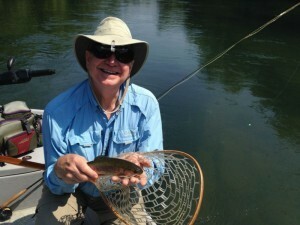 Although he has done quite a bit of fly fishing he had not hooked up a trout on a dry fly. As luck would have it about 3:00PM on a lower section of the river we ran into a beautiful Blue Winged Olive hatch. 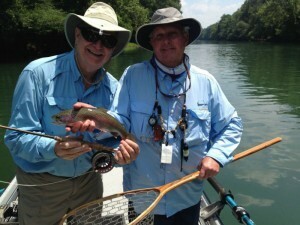 The guys took a bunch of Rainbows on emerges when David mentioned that he had never caught a fish on a dry fly. Bo had a little 4wt. Rise Fly Rod, from our good friend Steve Berchard, already rigged up with a #16 BWO dry fly and David went to work. It took a few tries to get a good drag free drift but before long David had hooked up two Rainbows on a dry fly! The Blue Winged Olive hatch should just continue to get better through the summer and the Hopper bite is just around the corner. I am sure that David will be back soon and if you want to try a little dry fishing just book a trip with Empty Creel Fly Fishing Guides and Outfitter and we will get you hooked up.